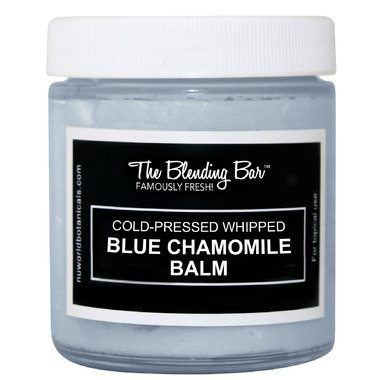 The Blending Bar Blue Chamomile Balm is a luxurious and versatile balm that can be used as a body balm, massage balm, anti-aging eye balm, cuticle balm and more! Extremely rich in natural oils, proteins, antioxidants and fatty acids, it leaves a smooth, satiny finish on the skin. Ideal for those with very dry and sensitive skin. Cold-pressed organic Cupuacu butter reduces skin degeneration and assists in skin flexibility, smoothness and softness; promotes long lasting hydration. Multi-uses: Use as an all-over body balm, massage balm, anti-aging eye balm treatment, lip balm, after-sun balm, foot balm, cuticle balm and more. Makes a wonderful addition to any DIY natural skincare and bodycare product.